Birthdays come but once a year. And it’s a damn good thing. Any more, and parents would be dropping like flies. Or I would, anyway. MJ’s party was four days ago now, and I’m only just feeling human again. As for my pocketbook, well, it may need a bit more time to recover. Because you know what? It turns out that even a super casual, bagels-in-the-park, cupcakes from Vons, no favor bags birthday party can be extraordinarily expensive. It might’ve been cheaper to rent a yacht. Who knew? But it was worth it. I think. Myra-Jean seemed to enjoy it. Mostly. I mean, let’s be honest–by the end of such a party pretty much any preschooler is in a stage five meltdown. What with the sugar, the attention, the pinata, the grownups goosing their cheeks–it’s enough to make even the most phlegmatic of four-year-olds blow a gasket. MJ, being no exception to this rule, spent the last half-hour of the party refusing to acknowledge departing guests and screaming “I just want to open my presents! !” I thought we were going to have to sedate her. Good times. But then it was over–the invitees headed home, the cups and plates cleaned up, the smashed Jupiter pinata stuffed in the trash, the remaining cupcakes tossed. We headed up the hill to our house and ate takeout lunch with our family. Everyone was starved. One thing you forget to do at these things is eat. As for MJ, she was all over the place. One minute she played with a new toy, the next she was sobbing over getting served the “wrong kind of chicken.” She said she’d enjoyed the party, but it was hard to tell. She was tired. She was mean. She was edgy. And this edginess lasted for the next three days. It only seemed to lift yesterday–the actual day of her birthday. I’d had to work–a fact deemed unforgivable by my daughter–and it looked like the day could be a total debacle. Myra-Jean was furious when I left. The four birthday-themed postcards I’d left her notwithstanding, I felt like the worst parent alive. But as the day went on, I heard that she cheered up. School was fun. The weather a bit cooler. In the afternoon she did some gardening with her father. And then I was able to get off early to meet them for dinner! At our favorite restaurant! We ate pho and crayoned pictures of Walter and Mina on small white pieces of scrap paper. MJ chewed french fries with fish sauce and seemed ecstatic to be up past her bedtime. After dinner, we went to ice cream; when we were done eating it I watched, grinning stupidly, as my husband and daughter danced to “American Pie” in the middle of the empty parlor’s floor. There, in that moment, I found the joy of her fourth birthday. And, judging by their faces, I’d have to say Mike and MJ did as well. No pinatas, no space decorations, no craft table, no hats. Just a quiet dinner, a sweet dessert, and the hard slate floor of an empty shop. Perhaps next year we’ll just skip straight to that. 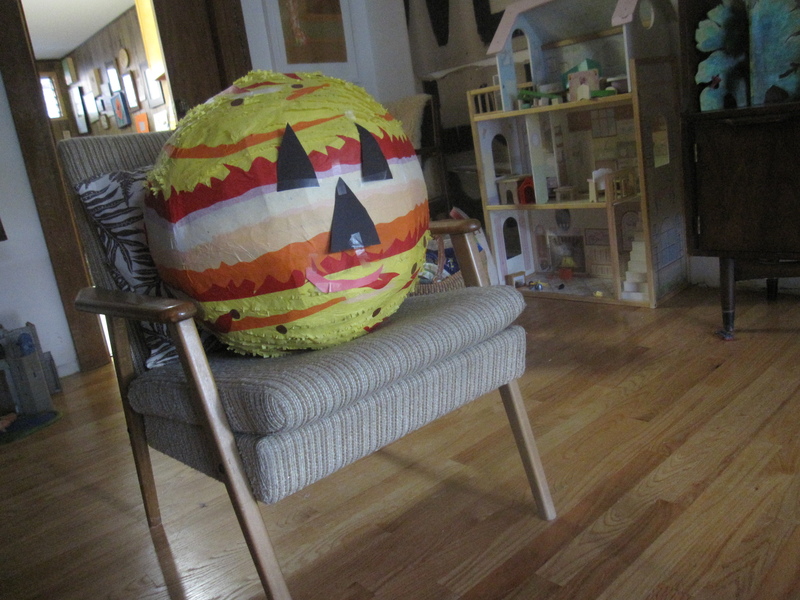 This entry was posted in cat, childcare, cleaning, dog, entertaining, Garden, household, Outings, work and tagged blue hen restaurant, four year old birthday parties, jupiter pinata, scoops ice cream, space-themed birthday parties on October 24, 2013 by thumbstumbler.